Get brilliant, accurate color prints with Dell's high-performance tabloid-size (11"x17") color printer. The Dell 7130cdn Color Printer delivers speed, responsiveness and professional print quality at a compelling price point, day after day or provide support for this kind of long-term print quality and price reliability . Compelling Cost Savings: Enjoy a low cost per page (CPP)1 and total cost of printing (TCOP)1. 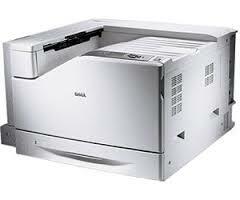 The Dell 7130cdn Color Printer handles a wide range of print sizes, paper weights and professional printing needs. This printer supports printing on recycled, renewable content, and chlorine-free paper. Flexible Paper Sizes: Print letter, 11"x 17" and banners in sizes up to 12.6" x 47.2" (320mm x 1200mm). Minimize downtime and enjoy multiple layers of asset protection with the 7130cdn's robust design.